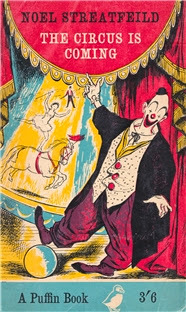 The Circus is Coming (aka Circus Shoes) by Noel Streatfeild: Reading the 1938 Carnegie Medal winner was a reminder of how much I enjoy Noel Streatfeild’s writing. I don’t know how, given my boundless love for Saplings, I could possibly have forgotten but there you go. I hadn’t read Streafeild in a really long time, and somehow I didn’t quite remember just how perceptive and emotionally precise her writing is. The Circus is Coming (I’m boycotting the “Shoes” title because a) I really like the original and b) renaming all of Streatfeild’s books as if they were part of a series strikes me as a little silly) tells the story of Peter and Santa, two orphans who at the start of the story live with their aunt. Aunt Rebecca was formerly maid to a Duchess, but this is not what the two siblings have grown up believing. All they know is that their aunt is acquainted with Very Important People, and that they are “too grand” to have anything to do with their neighbours. When Aunt Rebecca dies, Peter and Santa face the prospect of being sent to separate orphanages, and so they decide to run away and go looking for their only remaining relative — their uncle Gus, who works in a circus. As Santa and Peter meet the other performers and find ways to make themselves useful, their lives and their sense of themselves are completely transformed. The Circus is Coming is in many ways a story about class consciousness, and I liked how Streatfeild showed the slow erosion of the children’s sense of self-importance. This is a deep shift in worldview, and as such it doesn’t happen overnight — instead, it’s the cumulative result of many experiences that show the two young protagonists that the way they were taught to assess people’s worth is flawed. So. When we to England come it is for the tenting. That year was very hot. It goes to their hearts. One morning I go to the Wagon. One was dead. Another two was dead. In the end we have no sea-lion. Always it is so. You train them. They are clever. They are like your childrens. Then it is hot. They go dead. Add to this a wonderful sibling relationship and a warm portrayal of an unconventional family and of course I was sold. I have to make sure I don’t let years and years go by again before I read another Noel Streatfeild novel. The Young Unicorns by Madeleine L’Engle: This book really moved me, even though I suspect I didn’t get as much out of it as I would have if I’d read the other Austin family books first. That’s okay, though, because reading The Young Unicorns also made me want to read more (much, much more) of L’Engle’s work. It also made me realise that all of L’Engle’s books are set in the same universe, which, newbie that I am, I wasn’t aware of at all. The sudden reference to a Doctor Calvin O’Keefe and his research was a nice surprise. The Young Unicorns combines mystery and science fiction elements to tell the story of the Austin family and their friends Emily and Dave. The novel is set in New York City, and the plot revolves around the Cathedral of Saint John the Divine; a powerful Micro-Ray with the potential to be terribly misused; a mysterious theft that left Emily blind; a genie; a dangerous street gang known as the Alphabats; and a bishop acting in unexpected ways. I spotted several thematic similarities between The Young Unicorns and A Wrinkle in Time, which I’m guessing are more or less a constant in L’Engle’s work. Both stories are concerned with resisting totalitarianism, and both are underpinned by a belief in the value of individuality, choice, and human freedom — even the freedom to make terrible mistakes. Also, the way Mrs Austin is portrayed made me go back to my previous thoughts on gender roles and domesticity in L’Engle’s work — particularly a conversation between Suzy Austin and her mother about whether the latter giving up her music career means she gave up her chance to be “someone”. Mrs Austin doesn’t think so, but Suzy is starting to imagine different choices for herself. What I love about L’Engle is how thoughtful, searching and open her writing is: she may not always arrive at definitive answers, but she’s always willing to give the questions the nuance they merit. She’s a writer who doesn’t try to oversimplify the world, and I really appreciate that. Had his own fear of showing how deeply he cared (and therefore how deeply he could be hurt) kept him from giving the word of reassurance, the touch of tenderness the moment’s need demanded? Dr Hyde had gone to great pains to help Emily and yet given nothing of himself. Why is it to difficult to reach out and take a hand, to say, ‘Yes, I love you. I care. You matter to me’? I really need to make the time to read that Madeleine L’Engle boxed set I got ages ago. Love That Dog and Hate That Cat by Sharon Creech: ALL THE LOVE for these novels. Sharon Creech is a bit hit or miss for me, but at her best she’s one of my absolute favourite authors, and this is nothing if not Sharon Creech at her best. Love That Dog and Hate That Cat are two novels in verse about a boy, Jack, who’s studying poetry in class and whose teacher asks him to do writing assignments. Through his playful, warm and funny poems, Jack tells the story of his relationship with poetry, of his everyday life, and of the cat and dog that give the novels their titles. I knew I had to move these books to my own Readathon pile after reading that. Jack’s belief that being a boy is incompatible with writing poetry (a topic close to my heart if I ever saw one) is of course gently challenged as the story progresses — as is his unwillingness to sign the poems his teacher displays on the bulletin board for the whole class to see. Using remarkable economy of language, Creech manages to portray a moving and complex student-teacher relationship. The novels are told entirely through Jack’s poems, but his references to Miss Stretchberry introduce us to a smart, energetic and supportive teacher who takes Jack’s writing seriously and encourages him to develop his voice. Also, I can’t tell you how much I loved the fact that the high point of Love That Dog is Walter Dean Myers’ visit to Jack’s school. Creech shows just how much of a difference an experience like that can make to a child’s life in a way that’s moving and that never feels rammed in. These are beautiful books, and I can’t recommend them highly enough. Out of the Dust by Karen Hesse: The 1998 Newbery Medal winner is another novel in verse: this one is set in Oklahoma during the Dust Bowl years and it tells the story of Billie Jo Kelby and her family, who live in a farming community that’s hit hard by the Great Depression. The novel follows Billie Jo through some difficult times, but it ends on a note of hope that doesn’t feel facile. My favourite thing about Out of the Dust was how it did such a great job of using specific details to bring a whole historical period to life. It’s one thing to know that there were frequent severe dust storms in the 1930’s; it’s another to see the world through the eyes of a character whose mother urges her to turn all the glasses and plates upside down as she sets the table, because the short period between that and serving the food is enough for them to get covered in dust. Small details like that have the power to anchor big historical events to the concrete, and suddenly we get a glimpse of what it was like to have them be your everyday reality. Hesse’s novel is moving and well-written, and it made me want to read The Grapes of Wrath at long last. That or any other novels about the Great Depression you might want to recommend — suggestions most welcome. There's another Streatfield book? Maybe they were re-named so American children like me would have an easier time tracking them down in public libraries. 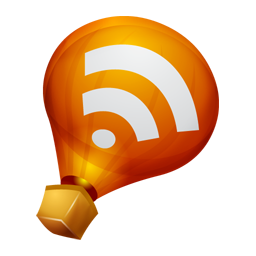 I had no idea there was another one, but back then I wasn't able to track down authors in systematic ways. Tobacco Road is the novel about the Great Depression that stuck with my mother, who lived through it as a child. If something looked trashy to her it was always "that looks like Tobacco Road!" When my kids were young, we read a YA novel entitled Bud, Not Buddy that takes place during the Great Depression, and I remember thinking it was good. Oooh, I have that! It's another Newbery Medal winner and I've been collecting them. I didn't know (or, more likely, had forgotten) that it was also set during this period. I need to make sure I read it soon. Thank you for reviewing one of my favorite Streatfeild books (deservedly a Carnegie award winner). I think in general her books have more psychological astuteness than people perhaps realize, with their shiny modern covers and formulaic renaming, and this is one of the best. I love my edition with the Richard Floethe illustrations, if you ever have a chance to view those. 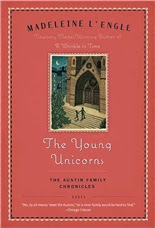 If you read the other Austin family books I think you'll find them quite different from The Young Unicorns...they are firmly centered around the viewpoint of Vicky Austin, where TYU makes the Austins more peripheral. Anyway, it'll be interesting to learn what you think. All of these sound wonderful! And thanks for the detail on the Streatfield title, I was almost fooled into believing they were actually part of a series. I have not read a single one of these; although I have read Grapes of Wrath, and while it was a long time ago, I have a strong memory of a very particular feeling - which I cannot describe (as is the case with so many feelings I get from books). In other words, I would recommend it. YAY. I am so pleased you liked The Circus Is Coming. It might be my favorite of all of Noel Streatfeild's books -- I love the arc Peter and Santa go through to discover what kind of people they want to be, now that there's nobody around telling them what sort of people they OUGHT to be. Plus, it contains one of my favorite lines ever -- Santa telling Peter that if he wants to know the truth, she's been a perfect Christian martyr of goodness. That never fails to make me giggle. Oh Santa. aw I have never read Noel Streatfeild even though I wanted to ever since You've Got Mail :) Also my nieces really loved her books. re: Madeline L'Engle, you know I loved that quote. I've only read an adult novel by her actually, which i think I liked but didn't love. Sometimes I have wanted to go back and read her other stuff. Love that Dog and Hate that Cat are fantastic reads! Now I want to read every book you mentioned. I've actually never heard of Noel Streatfeild but that book sounds really impressive - as does the Sharon Creech duo. And I love everything by Madeleine L’Engle!